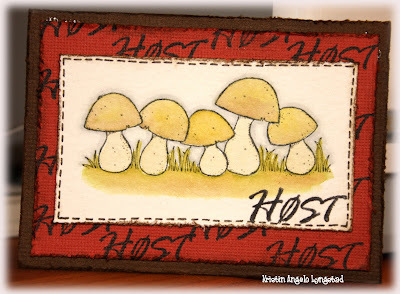 I made this ATC for the challenge "Autumn" on Art Pieces. Jeg har laget denne ATC'en til for utfordringen "Høst" på Art Pieces. Hei! Du er også inspirert av høsten, ser jeg! Er så glad for å bo i et land med VÆR! nothing like mushrooms to say autumn is on it`s way!! Love this stylish ATC! did you vote yesterday?? was on our news!! was great to see oslo again ~been so long!